Polypropylene tape film with special processed backing that allows taping over just about any surface, including freshly painted acrylic lacquer or enamel, with less chance of imprint damage. 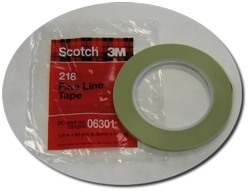 We use this tape to provide a guideline in the installation of most of our graphic projects. Roll Size: ¼ in x 60 yds (6.35mm x 54.8m).